There are many types of dock seals. Choosing the right loading dock seal can be a difficult task. Mustang Material Handling is there to help. We can offer different suppliers and styles of dock seals that fit your operating parameters. Dock seals keep out inclement weather, seal in (or seal out) the cold or heat. Using good dock seals can save thousands in heating or cooling costs. Solutions may include inflatable seals or loading dock shelters. To find out more about how much money can be saved by using the right dock seals, you can read more here. Mustang MH represents a complete range of foam and air inflatable dock seals as well as rigid, flexible and air inflatable dock shelters. 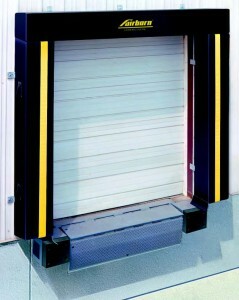 All products are designed to improve safety, protect merchandise, reduce cost and improve security at the loading dock. Many configurations are available from basic types of compression dock seals, standard dock shelters, inflatable seals to hybrid dock seal / shelter /inflatable designs. Yes, don’t forget that dock seals can help prevent loading dock theft. Here is an article from Inbound Logistics that talks about loading dock security. Loading dock shelters and seals can help with loading dock security. Mustang Material Handling has a qualified team of skilled loading dock equipment removers, installers and renovators that are available to help with loading dock seals for your facility, warehouse or distribution. Mustang Material Handling sells, services and installs warehouse equipment for customers in the Akron, Canton, Toledo, Cleveland, Youngstown, Columbus & Dayton, Ohio area. Go here, if you are looking for loading dock levelers. If you have a need for a specialized loading dock seals solution, the best thing to do is call us and discuss your needs. We are happy to offer assistance. (330) 753-7225.